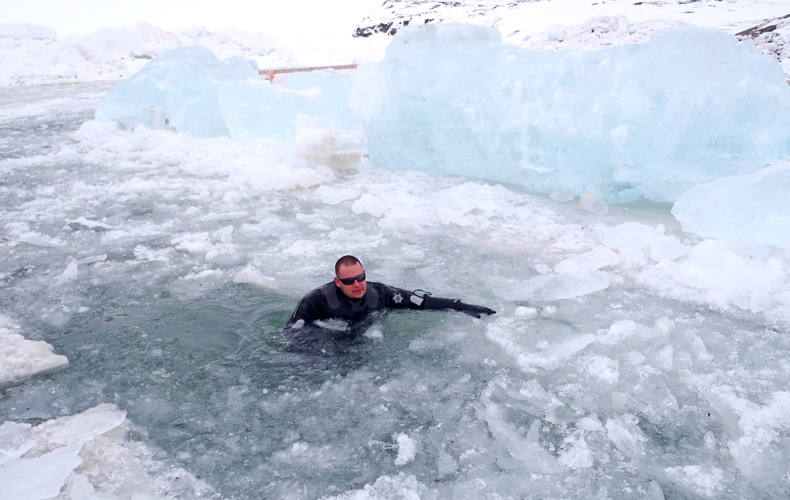 Nearly every week, Thomas Anthony Rolfe puts on 100 pounds of gear and dives into Canada’s freezing waters for hours at a time. Luckily, he gets paid handsomely for it. Rolfe, 29, has worked as a commercial diver for Northern Underwater Systems in Edmonton, Canada for three years now. His company regularly flies him and his three teammates to different parts of the country to build, repair, inspect and occasionally demolish underwater structures for customers that operate everything from oil pipelines to power plants. The job is dangerous: the weather can be punishing, it’s often difficult to see in the murky waters, and there’s the constant threat of malfunctioning equipment and loss of air supply. But it pays well, with full-time workers like Rolfe making around $91,000 a year. This summer, Rolfe was sent to Yellowknife, the capital of Canada’s Northwest Territories, to complete a number of jobs, including an inspection of an underwater pipeline that supplies tap water to the city. I wake up in my hotel room. I’m not much of a breakfast guy, but I always have coffee. This morning I grab a granola bar, too. Before leaving the hotel, the team packs up our lunch from the hotel fridge. My three teammates, Jesse, Jason and Andy and I pick up our rented pontoon boat. Then we go to the “dive shop” to get our diving gear ready and place it on the boat. We drive over to the lake, get everything we need on the boat and launch the boat into the water. 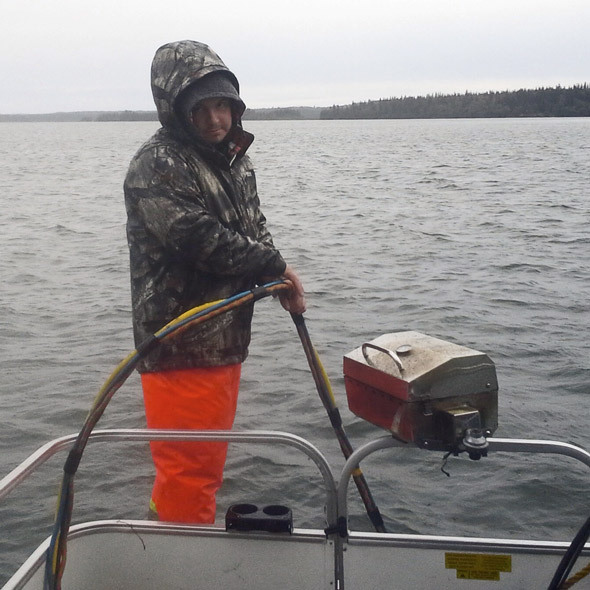 It’s about 50 degrees Fahrenheit outside with high winds, rain and choppy water, so it’s difficult to operate the boat. The weather is awful, but I’ve experienced far worse. In the winter, the temperature can regularly fall below 40 degrees. The weather today: Windy and rainy. The weather in winter: Sub-freezing. We sail over to the pump house to meet our City of Yellowknife contact and discuss our assignment for the day. Yellowknife pumps fresh water from a nearby river and we have to check that the pipe isn’t punctured and sucking in water from the local lake. 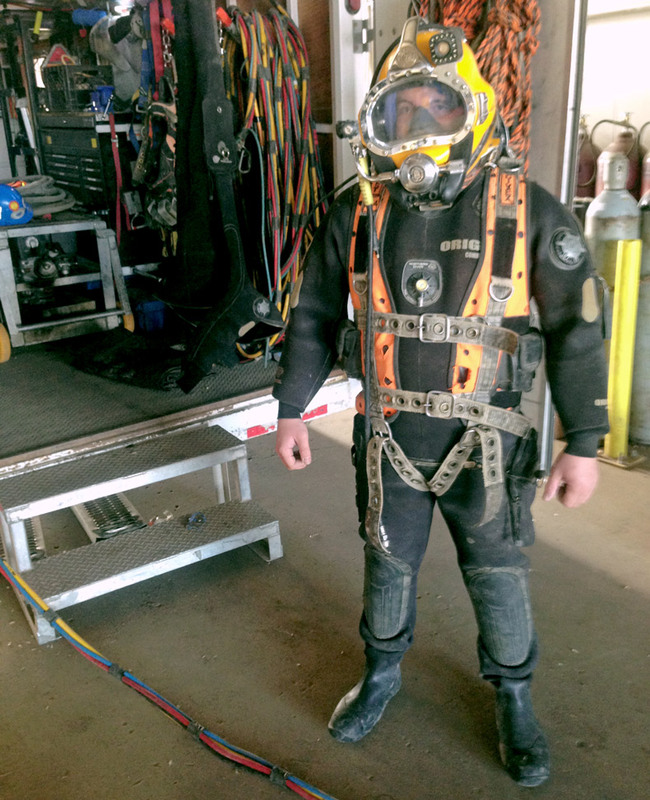 The first diver on our team, Andy, puts on his gear. The gear includes fins for swimming and a “dry suit,” which looks like a giant onesie. Each guy has to buy a dry suit for themselves. Mine cost $1,535, which is middle-of-the-range. On top of that is a weighted vest, with 40 to 50 pounds of lead. The vest includes a harness and “umbilical cord” system. The umbilical cord is your lifeline: It pumps air to breath underwater, lets you speak with your team on the boat and it also has a depth gauge and a video line so your teammates can see what you’re seeing. On top of all that, there’s a helmet that weighs 30-40 pounds. We begin the first dive. The water here isn’t too deep. The diver – Andy – crawls along the lakebed floor checking for cracks in the pipeline. It’s pretty simple to check for problems with your hands since it’s a nice smooth, wrapped pipe. On the boat, a teammate holds the umbilical cord to make sure the diver is moving well and the cord doesn’t get caught in the engine’s propeller. I’m in charge of controlling the radio panel where we monitor the diver’s air supply, breathing and communications. If the diver sees something while he’s underwater, he’ll let us know. After a two-hour dive, Andy comes up to the surface. Since the gear is so heavy, divers generally climb up the umbilical cord to get to the boat, instead of swimming up. We use GPS to mark our position in the lake so we can come back after lunch. Then we sail over to a cove to hide from the wind and rain. 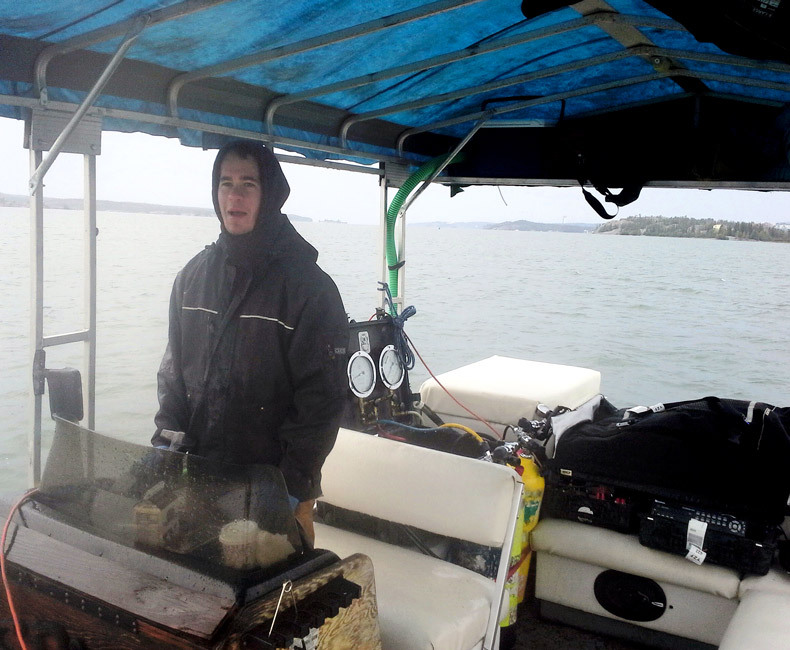 We’re lucky enough to have a portable barbecue on the boat so we can make burgers. I also brought a salad bag. After lunch, we go back out to the spot we marked using the GPS. 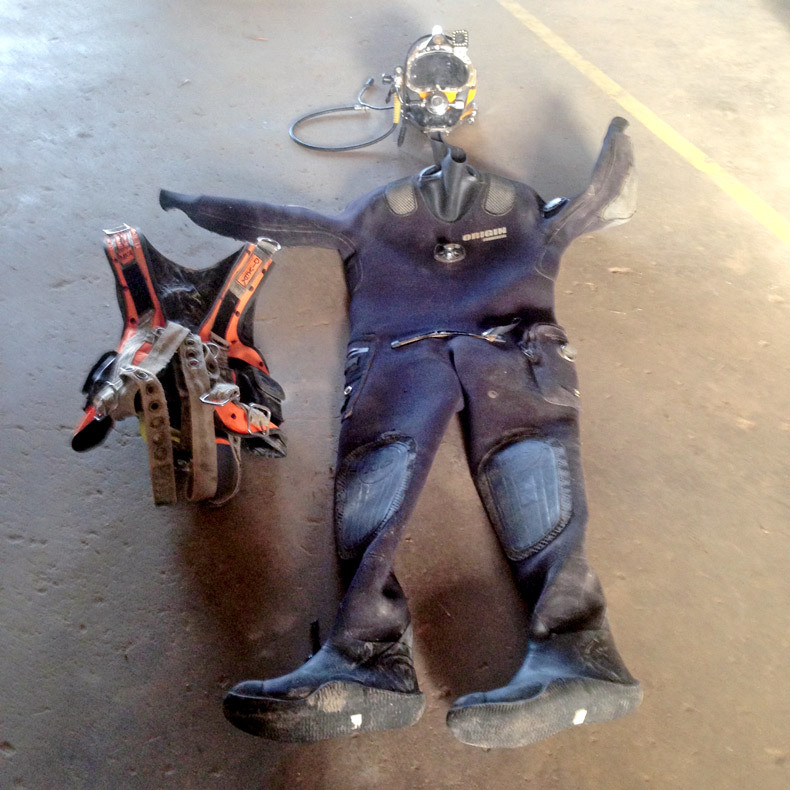 The second crew member – Jesse – puts on his gear and starts his dive. Since he has to go down to a depth of 60 feet, his dive is limited to 50 minutes. When you’re down really deep in the water, nitrogen bubbles can start to build up in your blood, which can be dangerous. We always have to be watching for any hazards when divers go down. 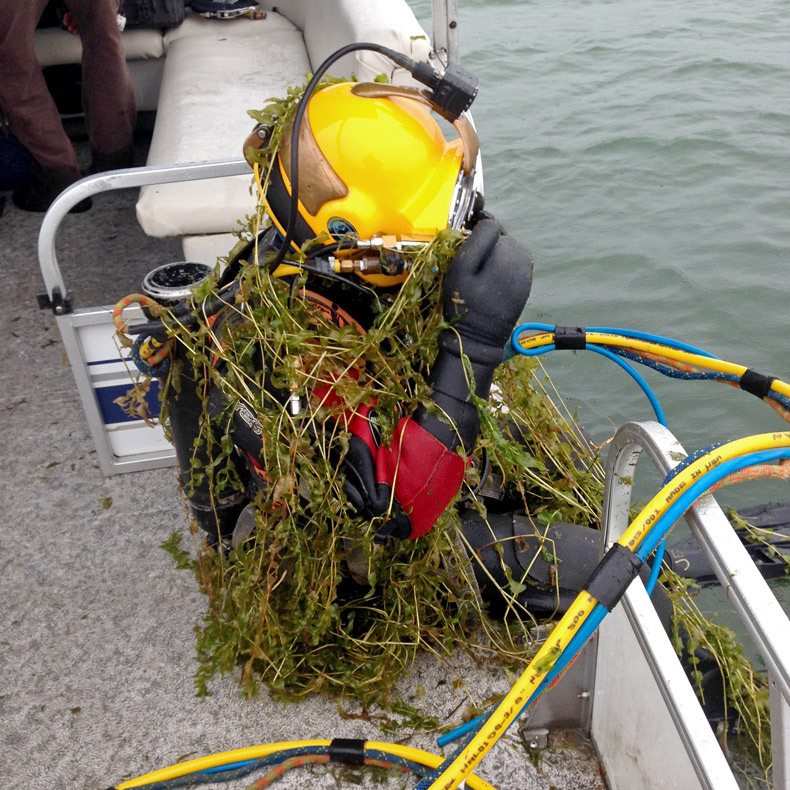 Equipment problems could spring up and there’s also the danger of getting tangled in seaweed and muck at the bottom of lakes. One time I had chunks of steel fall on my airline during a dive. I get ready to go under. I begin my dive. It takes less than 30 seconds for me to drop to the bottom of the lake and visibility was great. I can see about 10 feet ahead of me. I crawl along the pipe and don’t find any problems. It’s just me and the occasional fish down there. After covering about 1 kilometer, I climb the umbilical cord to return to the surface. Once I’m done my dive, our supervisor Jason enters the water. It’s shallower now so he can take his time on the bottom. Jesse manned his umbilical cord, Andy drove the boat and I was in charge of the watching the panel again. It’s easy to get bored when you’re on the surface. But you have to stay alert for any emergencies and you can’t slack off. This is me manning the umbilical cord on a different day. After two hours, the final diver exits the water. None of us discovered any issues with the pipe. But if we did, there’s no quick fix. You can’t just throw some tape on it and hope for the best. We would have had to develop a plan with the city. We’ve covered 3.7 miles of pipeline over the course of the day, but we still have more to cover tomorrow. We mark our position again with GPS so we can come back to the same spot tomorrow to finish off this job. We take our boat out of the water and hoist it onto a trailer. We drive our boat back to where we picked it up. Then we drive to the “dive shop” to unload our wet dive gear and hang up our dry suits to dry. We get back to the hotel and just hang out. I make myself a chicken salad for dinner and watch a bit of TV. I also text with my wife, Christine, so she knows where I am. Christine will text me throughout the day with updates of our kids and pictures of them. We have a 7-year-old daughter and a new baby son. I miss them when I’m working. Especially when I'm away for weeks at a time. I go to bed around midnight, knowing we’ll be back at the lake tomorrow to finish our job.